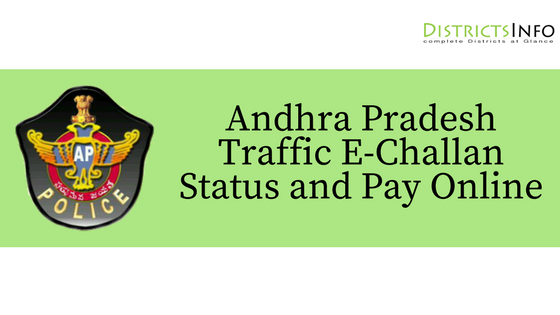 Andhra Pradesh Traffic E-Challan Status and Pay Online: In this busy life schedule, many people are going to their works in a hurry. Sometimes they just cross the signals unexpectedly before it stops. There are more reasons like over speeding, stop line at traffic lights, incorrect U-turn, wrong side driving etc. when someone breaks the traffic rule. So the camera on the signal (or) Traffic police persons will capture Vehicle Registration details like their vehicle number, or the vehicle name with the number. They will just update this picture or this information in the Andhra Pradesh e-challan website. You just need to check the status of your vehicle almost every 15th day. As sometimes you also didn't get to know that you have already broken the traffic rules. Also, Check Telangana E-challan. As it doesn't matter that you have done it by mistake or purposely. If any payment is due you need to pay the amount online (or) through Internet banking. If you don't pay the due on time, you may have to face some extra penalty. * Inappropriate License Plate Design, etc. 2)Enter your vehicle number in the field and fill the captcha then enter the Search button. 3)If your vehicle doesn't have Penalty then it will show the bottom (No Pending Challans Found). 4) If it showing penalty you need to pay the amount of that echallan and you can check the captured photo. West Godavari, Vizag Rural District, and Vijayawada Police Commissionerate Challans can only be paid using PayTM. Note: Download AP Police Traffic eChallan iOS & Android App to Pay Challans, Raise an Issue on Challan, Police Contacts, and many more features. Visit your nearest Meeseva or ApOnline Center to pay eChallans.